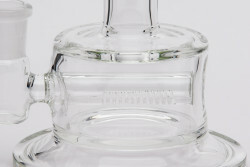 The Micro Inline is a large body bubbler designed to be a concentrate tube, but has become popular as an all-around perc. A bistible or direct inject housing leads, through a pass through seal, to a polished inline assembly. These cuts are not gridded as the advantages of adding gridding to an inline is minimized when the goal is not massive diffusion, but temperature reduction. This tube produces bigger bubbles that travel through water a small distance, leading to lower diffusion, but ample temperature control. This tube is perfect for the right job, concentrates.